My sister is member of the varsity song squad at her high high school. She doesn’t fit in with them very well so when the squad decided they were going to all dress up as characters from Alice in Wonderland they picked without her and told her she had to be one the singing flowers. My sister was of course upset that she didn’t get to be a main character like the other girls, especially since she is the only blonde on the squad (perfect for Alice). She also had no idea where to find a cute flower costume. Listening to her of course brought out my competitive side and I told her we would just have to make sure she was the prettiest flower they’ve ever seen. 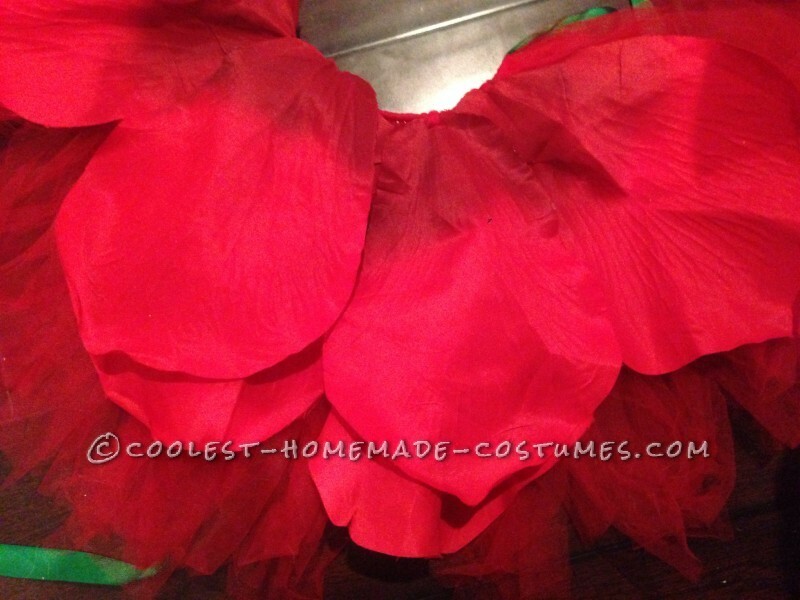 I already knew how to make a tutu from a previous peacock costume I had made so I decided that would be the main part of the costume. I went to Hobby Lobby to get the tulle I needed, which was on sale for $1 a yard, I ended up buying 6 yards. 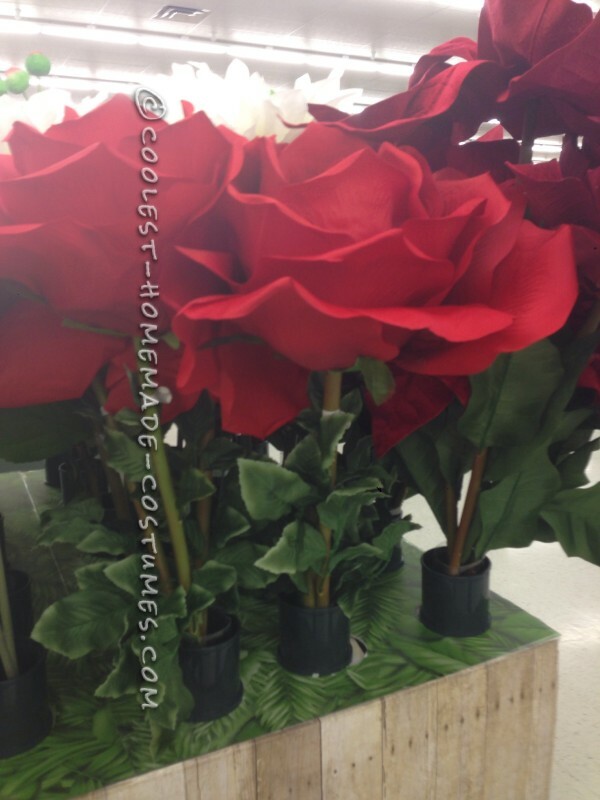 I started walking around to see what else I could use for the costume when discovered the silk flower section, in the middle of everything was a 4 foot tall rose! It was originally $40, but was half off. I could not believe my luck. I also got some green ribbon to use to make the skirt for $3. I immediately went home to start working on the tutu since I knew it would take me the longest. This is an easy no see tutu, but it is very time consuming, I worked on just this part for at least a half hour every night for a week. 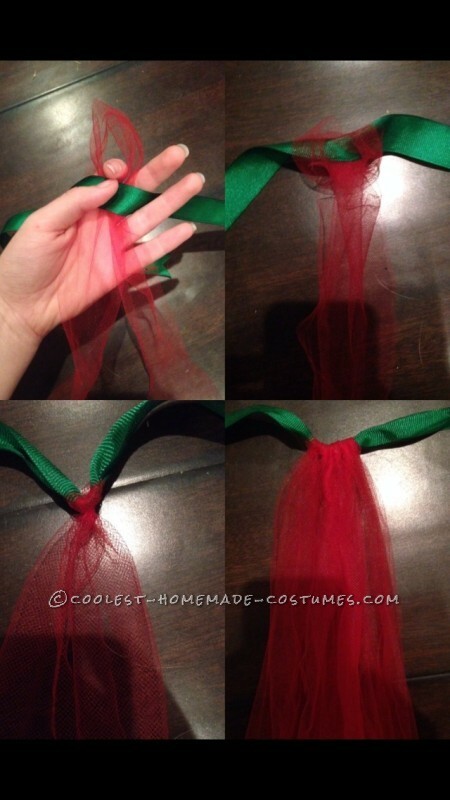 You start off by taking the ribbon and tying it around your waist and cutting it to the length you want. I have seen other people use elastic or Velcro but I personally like the look of tying a big bow on the back of your tutu, so I use ribbon. Next you will cut your strips of tulle about 1 1/2 to 2 inches thick. Honestly the strips don’t have to be perfect, it takes way too much time otherwise and any mistakes are hidden once the tutu is complete. 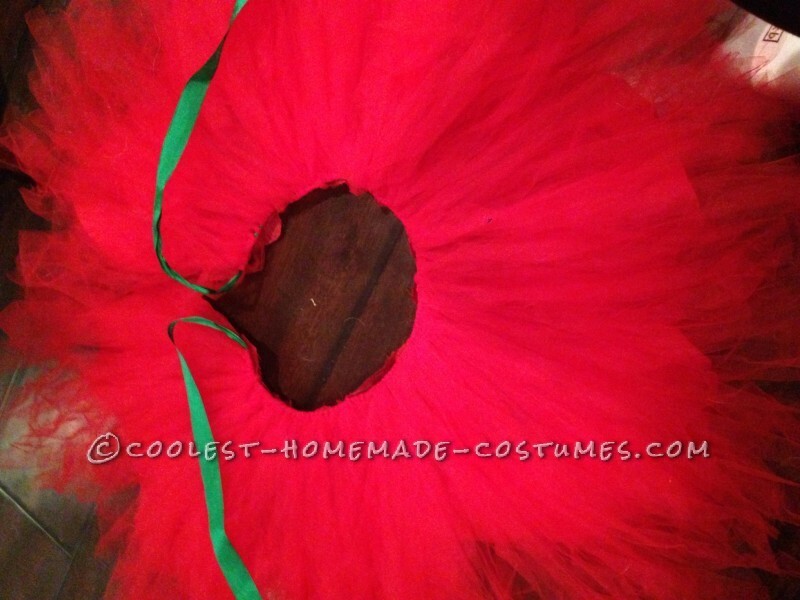 As for the length of your strips, make sure it is double the length you want for the tutu. Once you have your strips, take one strip and fold it in half. After folding it in half the side with the fold will create a small loop, take this side and hold it behind your ribbon. Next, thread the two end pieces over the ribbon and through the loop, pull tight. 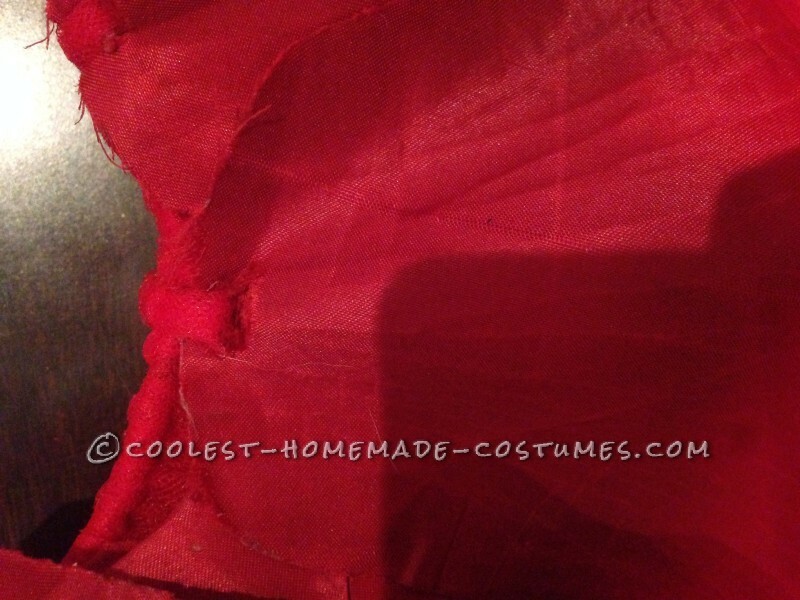 I did this for each and every strip until I got the desired fullness of the skirt. The closer together the ties are, the fuller the tutu. I spread mine a little further apart than I normally would have since I knew I would be adding the rose petals on top of the tulle. Next, I took apart the giant rose I bought. 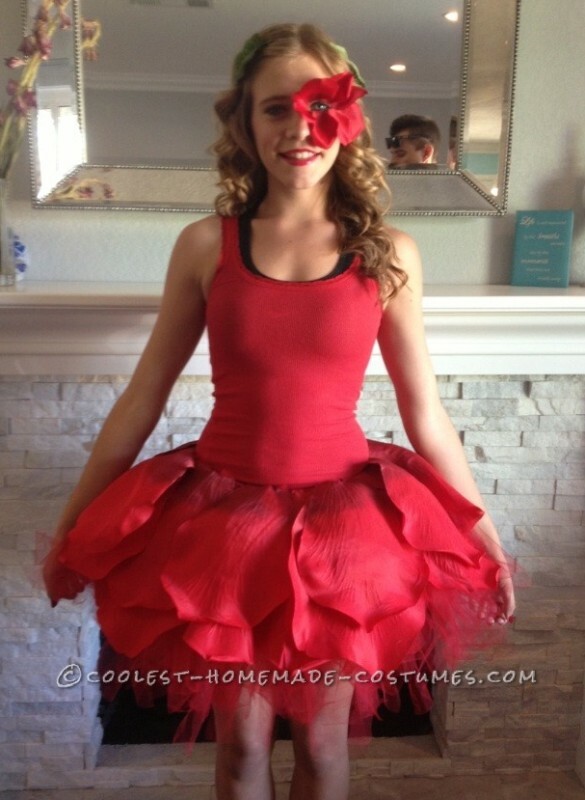 The petals were all glued on to a styrofoam ball in the center so they came off easily. I had a little more trouble with taking the bits of glue off each of the petals, but I was able to scratch it all off without any leftover marks. Now I considered sewing each of the petals onto the skirt, but I had 5 other projects I needed to get started on so I decided to cut a small slit in the top of each petal and just tie them on. This required untying some of the strips of tulle and then threading them through the slit in the petal and retying them, but since I’m just learning how to sew, this method was easier for me. The petals were 3 different sizes so I did them in layers. First I evenly spaced the 4 large ones, then I alternated the 5 medium ones, and finally I added the 6 small ones. 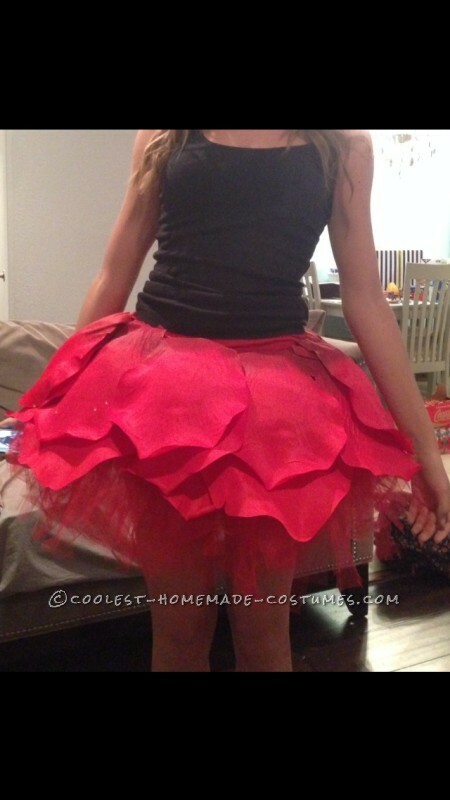 Once I finished the tutu I had my sister try it on to make sure everything would lay correctly. While I was adjusting things she kept trying to do pirouettes in it and I had to keep yelling at her to stop because she had injured her hip the week before and was benched for awhile. She just told me that she felt like a pretty ballerina and needed to dance around in her costume. 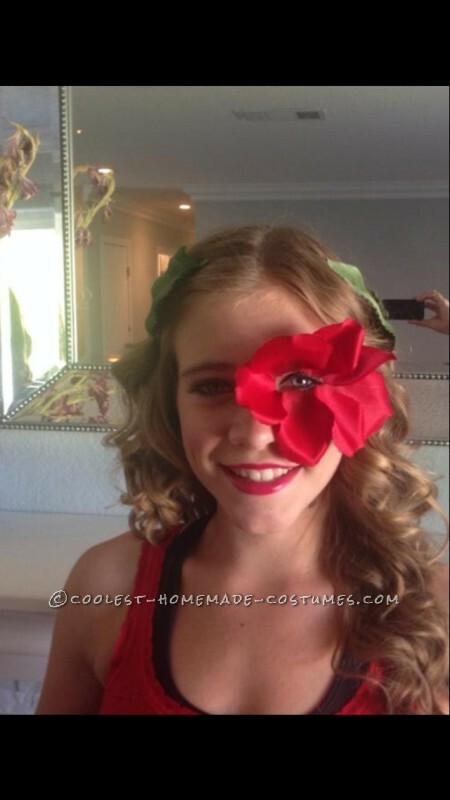 Now the hardest part of the entire costume was probably adding the smaller petals around her eye. We did a test run the day before she had to wear it to see if it would even work. First, we tried eyelash glue but the petals were too heavy. Next, she tried double sided tape, but it irritated her skin. Finally, I remembered I had some liquid latex left over from some monster make up. This is used to hold fake noses on so I knew it would work. It actually worked a little too well because she had a hard time taking the petals off later. I ended up using 5 that I layered just below and above her eye. 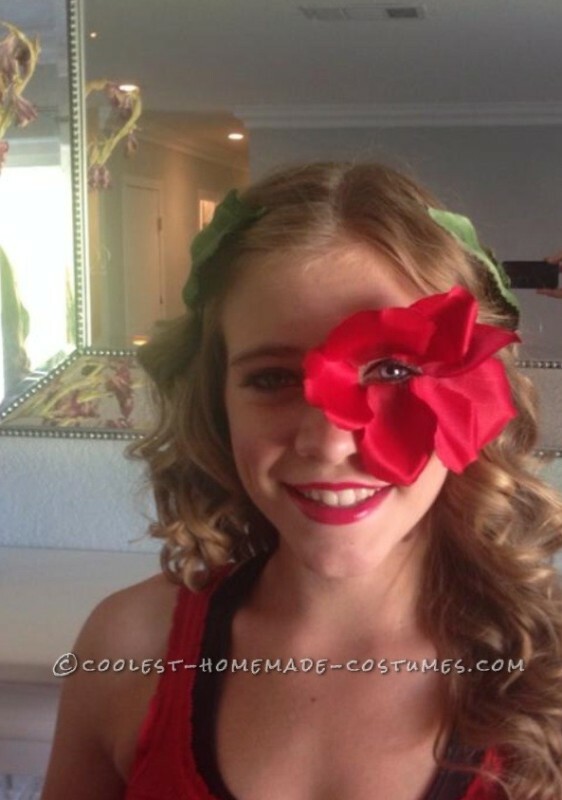 I also hot glued the leaves from the large flower onto some hair clips and put those in her hair. It was a lot of hard work to create the finishing product, but it was so worth it. Everyone loved her costume! She had the best one out of all the girls, they were really jealous. As you can probably tell, I’m a little competitive. We both got a lot of compliments on the costume, I’ve even been asked to make similar ones for other kids. I can’t wait to get started on them since I had so much fun making the first. That is a beautiful costume, even though your sister’s fellow singers acted so ugly towards her. I really love this costume very creative. Nice job! How did you make the big petals? Did you buy them? If so where from? Thaks :) p.s. it is fab!